Characteristics: A dense, medium sized evergreen shrub or tree, depending on pruning and care. Growth & Spread: Is a medium-rate grower. It can reach heights of anywhere from 4 to 9 m and spreads of 2.5 to 5 m.
Flourishing Season: Red lantern blooms in the late spring through summer. Water & Maintenance: Prefers a moist and well-draining soil. Relatively low-maintenance. This plant has one of the more unusually-shaped blooms and they are spectacular. During the blooming season, at the end of red and green stalks form fleshy, cherry-red flowers of approximately 2.5 cm in length. 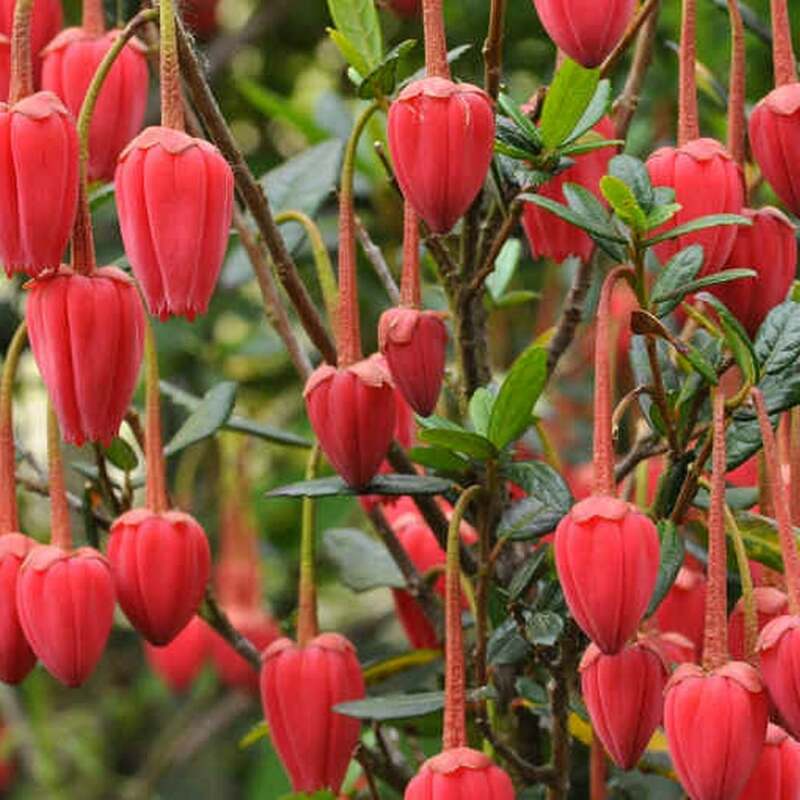 These dazzling blooms are spread throughout the mass of the plant. The “Lantern Tree” has lanceolate leaves, which are leathery-thick and narrow. The overall formation of the foliage of the plant is bushy and somewhat densely grouped. It can tolerate most temperatures in the UK down to about -10⁰ C, although it does prefer to be sheltered in order to be protected from cold, dry winds. It also prefers full sun to partially shaded areas that tend towards the sunnier side, but with the ability to keep its root system cooler and shaded. The plant thrives in more acidic soils and grows with a more-or-less upright and open habit. The pruning should be limited to dead branches and other dead areas. They are generally disease and pest free.